Swedish act RÅG I RYGGEN was founded in 1971, based in the captitol city of Stockholm. According to the sparse sources available on the band they never managed to get a consistant line-up, as members were coming and going quite a lot. Legend has it that a night of boozing lead to the band being signed. Peter Sandberg (drums) had apparently been out enjoying Stockholm's nightlife, and while waiting for public transport to arrive at Stockholm's Central Station he met and started discussing music with a guy who was there. Both of them were in a rather jolly mood according to the sources; and as the guy in question was a record producer the drunken discussion ended with Sandberg's band being invited to record an album at the studio the guy was working at. 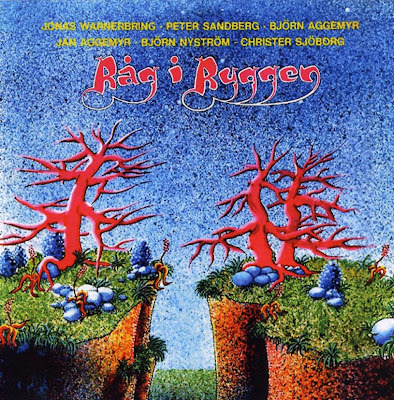 The end result of this was that Sandberg and his fellow musicians Björn Aggemyr (bass), Björn Nyström (guitar), Christer Sjöborg (organ, keyboards), Jan Aggemyr (guitar), and Jonas Warnerbring (vocals, flute) got to record their one and only album; the self-titles production "Råg i ryggen" which was released in 1975. In 1976 Warnerbring and Sandberg left the band; replaced by Bo Lantz (vocals) and Jonas Edgren (drums). This new line-up didn't last long though, and after a concert late in 1976 the band fell apart.